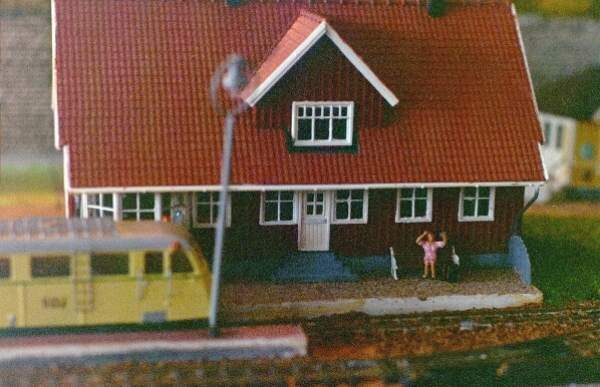 This part is about version 1 of Slötorp-Dåseberga model rail road in H0 (1:87) scale. It is made to fit into an ordinary 60 cm (2') wide standard wardrobe suiting less avialable space. As a variant of the shelf layout one can think of "the train in the wardrobe". An ordinary 60 cm (2') standard wardrobe works perfectly. It allows a length, width and height large enough to accomodate a setting in standard gauge for N-scale, or in narrow gauge for H0. If using narrow gauge the 9 mm tracks works best. The totally available size is about 1740x540x250 mm which is quite enough for a smaller module or diorama-ish layout. These facts was the base when I started over about 20 years ago with a new layout. The lack of space was total and it had to be possible to stow away from interested children. The base was made from 7 mm plywood into a rigid box shape screwed and glued toghether. The corners are just enough for a good joint but it is necessary to drill a guide hole to guide the screw correctly. It becomes very strong when finished. The height of 250 mm allows for layouts in two levels, but try to plan so that the slope does not become too steep. If setting on a two-level layout, remember to include passages in level one for running cables and such. By fitting a narrow strip also on the under side at one end a sort of hook is created (see A in the picture below) which can be used to hang the layout on the door of the wardrobe. This is the construction of the frame and base for Slötorp-Dåseberga version 1. Bild 1: The base for the layout made from 7 mm plywood. As the flat surface for the tracks are about 30 mm above any table or leg structure there will be a useful space for cabling and switch machines. The controls are not fitted to the baseboard, but are mounted on a separate base which at the same time is its storage shelf in the same wardrobe. To hang the layout on the inside of the wardrobe door I made a console from two strips of wood secured with countersunk screws at the edges of the door. Glue the two strips of wood together to make it sturdier, see picture below. Bild 2: The hanging console on the inside of the wardrobe door. Since a standard wardrobe (at least in Sweden) is about 60 cm (2') deep and the layout only uses about half of that, the rest of the wardrobe becomes the perfect storage space for binders and magazines, not to talk about engines, carriages and other important stuff. On this relatively limited surface it is still possible to make room for quite much. 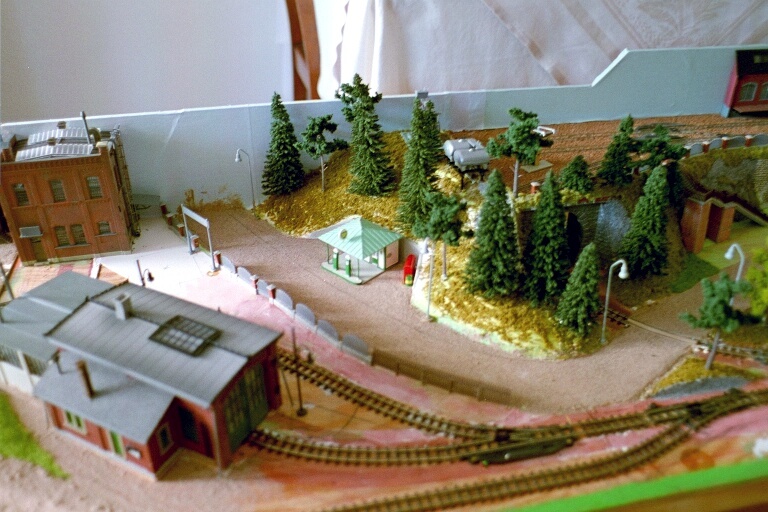 My layout at the time became a two level layout with a small industrial yard, a small line station, and a small loco shed and maintenance area. The line station was placed on the long side of a round track. H0n3 or H09 was the next question. I choose H09 because then any standard track from Liliput or Roco could be used. There I choose Roco as they have a nice side line track system including flex track and sutaible switches. In my case the track width is 1.5 mm too narrow to exactly replicate Swedish standard narrow gauge, but price/time realtionship made all the difference. How tight can curves be? Well, my solution was to choose the smallest radius used for N-gauge, then I know that all N-gauge drive units will run through. In addition it was also decided where to place isolation points before track was laid and connected. The following picture shows the final layout of the track. In reality the oval tracks rear part (green) is placed immediately below the industrial yards (red) track above. Having 8.5 cm between the levels the difference is enough for standard H0 steam locos and diesels, and at the same time not so large that there may not be enough space for a connecting slope track. Slightly too short yes, but it does not look wrong and the locos can run up and down the slope without problems. Include an opening at the back of the layout between the two levels to be able to remove side-tracked vehicles that way. Well, real or not, inspiration is fetched from reality anyway. As this was a new layout following a long pause for family and kids, I decided on a Swedish type environment. Not from a particular place, just Swedish. The new viewer should immediately recognize a Swedish environment and be able to connect it to all or parts of his or her own memory. That will also allow me to re-create the objects that I like and have time to build or re-construct. The following rather un-focused pictures will, I hope, give an idea of how it looks after 20 odd years of building. Bild 4: Slötorp Station with a Railbus Arriving. The station is an old POLA model of the Diö station converted to be Slötorp. The arriving railbus is painted in Swedish State colours, but will be re-painted in private line colours later. 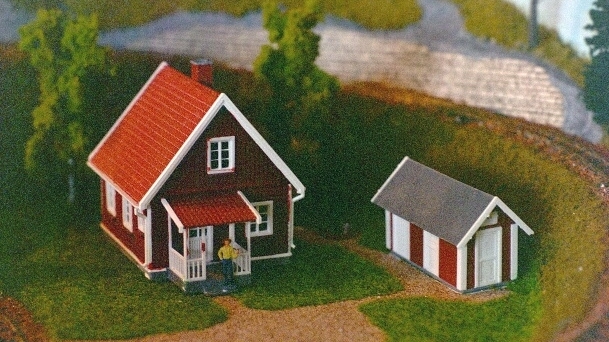 Bild 5: The Small Goods Shed in Slötorp. 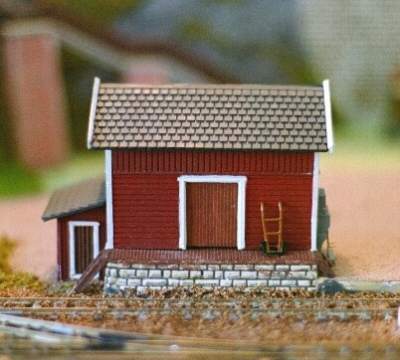 The goods shed in Slötorp is also a Heljan model from the beginning but have got a new base instead of the plinths from the origninal. Bild 6: Johansson Lazily Thinking on His Porch. The track guardsmans cottage also comes from Heljan together with shed and well, some typical Swedish attributes. We can also see track guardsman Johansson standing lazily on his porch. Bild 7: Nisses Countryside Shop. 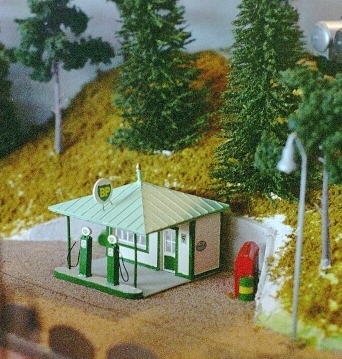 The typical countryside shop that supplies everything is scratch built from a drawing in the magazine Smalspårigt. 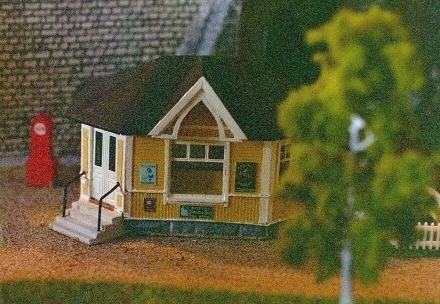 In the magazine the house was a small office but my layout does not have room for any large buildings. This was perfect in size. Bild 8: The Industry as a relief against the background. The industry is also a scratch build, here making up a more lively or less flat background. The industry fence from Kibri fits well into the picture. 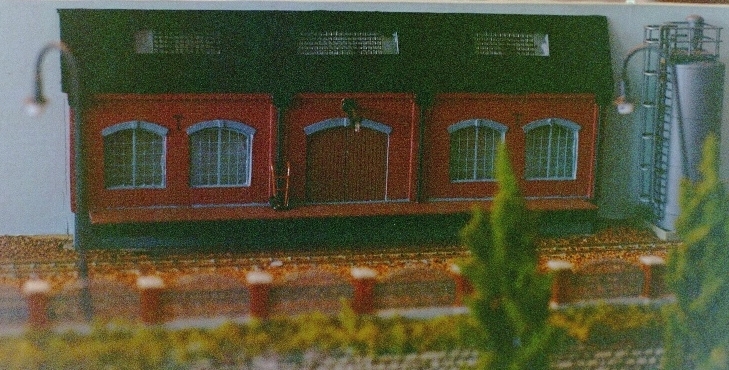 Bild 9: The loco works with shed and workshop. The loco works from Vollmer/Kibri is perfectly usable as older Swedish buildings. Bild 10: The old petrol station neds no further explanation, here in the BP livery. Finally the petrol station. Again a scratch build from a drawing in a magazine. All in all this seems typically Swedish. During the first half of the 20th centry german was the primary technical langauge and due to that and natural influences from south it is quite safe to use a lot of the industrial structures even though depicting German models. When it comes to housings for living, railway stations and others, then these are typical for Sweden on their own particulars. It is on these two sites where the updates often appears first, so don´t miss looking in there as well.